One of my childhood comfort food is fish cakes or fish balls and somehow I just enjoy eating them. As such, even as I was planning the Thai dishes for this month’s blog recipes, I just had to include this Thai Fish Cakes (Tod Man Pla) recipe in! I am sure you will agree with me that this is one of the most prominent appetizers in most Thai restaurants’ menus apart from the papaya or mango salads. This is quite an easy dish to make and nice to devour too. The kaffir leaves makes it aromatic and the long beans adds texture to each bite. You can either eat it as it is or you can make a dipping sauce to go with it. Not going to say more here now as I cannot wait to have more of this yummy fish cakes. Dipping sauce: Combine the following ingredients in a small serving bowl. 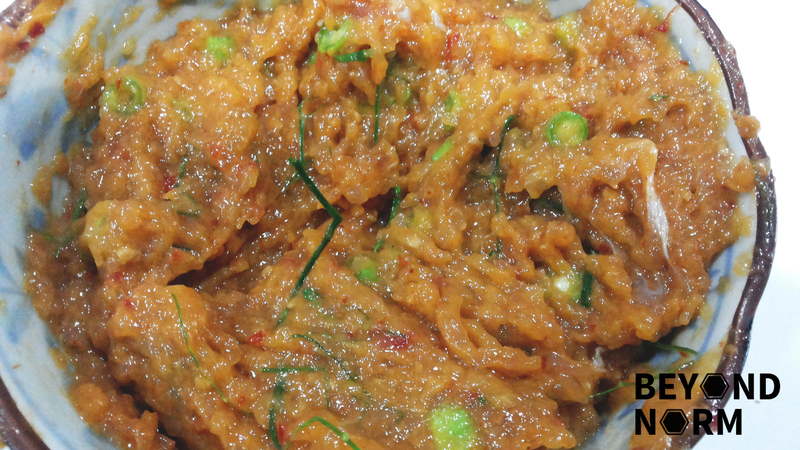 In a food processor, add in the fish meat, corn starch, egg, curry paste, sugar and fish sauce. Combine them until the mixture appears mousse-like in texture. In a mixing bowl, add in the fish meat (roughly chopped), corn starch, egg, curry paste, sugar and fish sauce. Stir briskly with a wooden spoon until the mixture is homogeneous, thick and sticky like a mousse. Transfer the fish paste into a bowl and fold in the sliced long beans and kaffir lime leaves. Oil hands and form ¼ inch-thick rounds with roughly 2 inches in diameter. 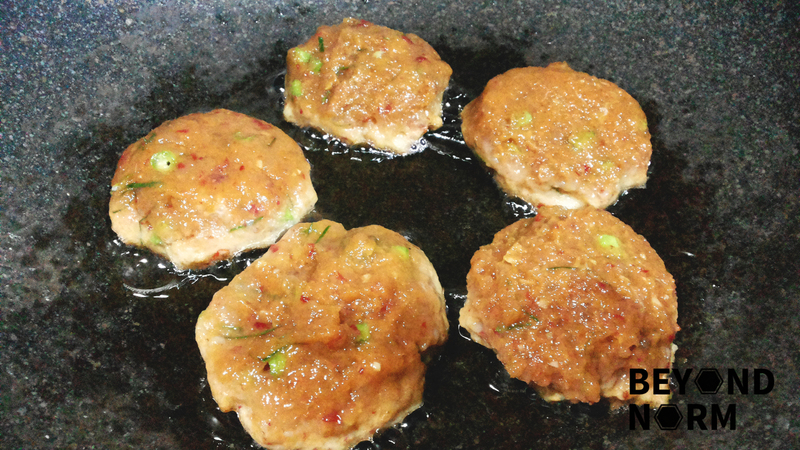 Heat oil in low heat and once it is hot, gently slide the fish cakes into the oil. Once one side is golden brown (about a minute), flip them. The fish cakes are done when you poke them lightly with the tips of the chopsticks or tongs and feel the bouncy resistance. 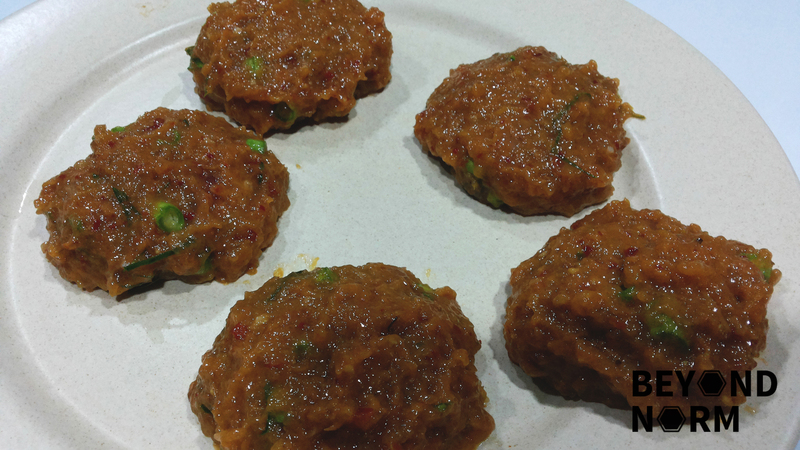 Serve the fish cakes with the dipping sauce as an appetizer or a main dish with rice. As usual the seasonings are just a guide and you may adjust them according to your taste buds. 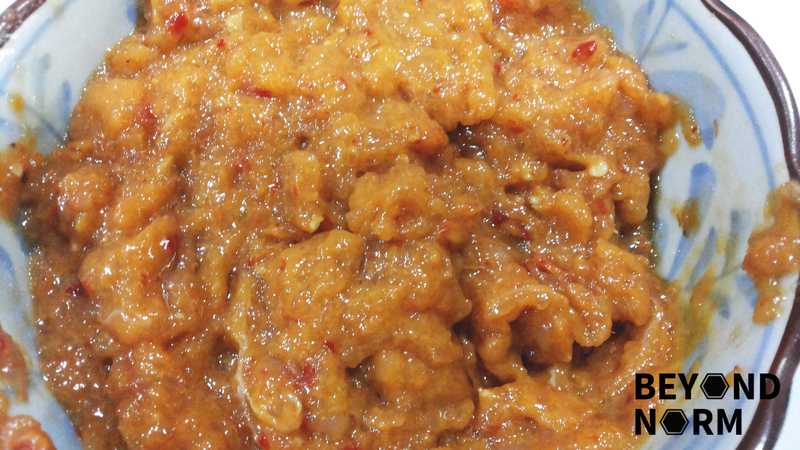 I use my own homemade Red Curry Paste (Prig Gang Kua) instead of store bought for this recipe. I usually make a lot more than required and freeze the paste in the freezer in small quantities. Once you have tasted the flavours of a curry paste you made yourself, you will not want to use the bottled ones from the store. But making this paste requires some hard work and a Mortar and Pestle. Looks yummy and one of my favorite dishes to order from restaurant. Would appreciate very much for the Thai red curry paste. Tqvm. 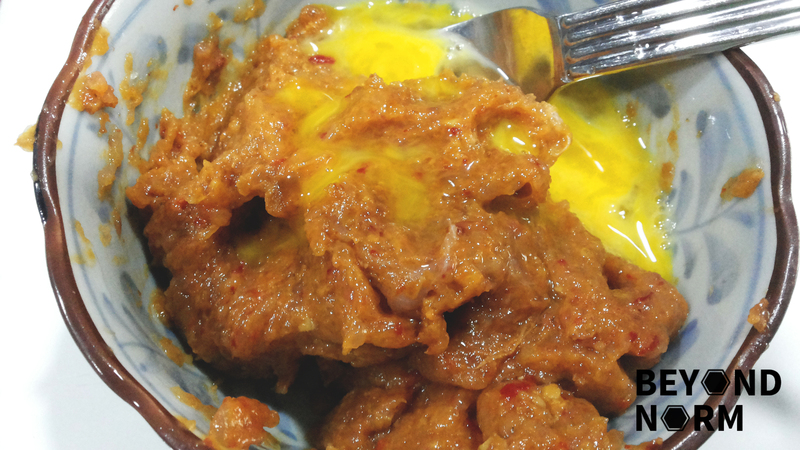 Wud greatly appreciate the recipe for the red curry paste. Tqvm. Ok share red curry paste recipe, tks very much. Btw I clicked on the fish paste above and it did not lead to instructions on how to scrape fish paste. One of my favorite food & I’ve been looking for good recipes. Definitely gonna try this from scratch. Is it possible to share your red curry paste recipe too?